"It was said that he always wore a string of very good pearls round his own neck, and never took it off for fear that the loss of the warmth of his skin might spoil their quality. One night at the beginning of 1940 there was an air raid warning at Oxford, where he happened to be acting in a new play, and was staying at the Randolph Hotel. All the guests were ordered to go down to the basement shelter. Ernest created somewhat of a sensation, vividly dressed in Russian high-necked pyjamas and a spectacular dressing-gown, and sat bolt-upright in a corner with his spectacles on his nose and a piece of embroidery in his hands. After a while the assembled company began to doze and he knew he was no longer attracting such conspicuous interest. Suddenly he clutched his throat and cried 'My God! My pearls! No, no, it's all right. I've got them on.'" 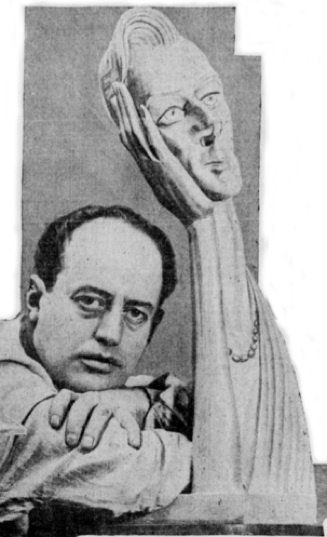 Sava Botzaris with his portrait of Ernest.